I love when Nalini Singh ventures away from core Guild Hunter couple Elena and Raphael to explore his Seven. I’ll admit, I’ve been on the “give us a Bluebell book!” bandwagon for some time. However, getting to read a book where Naasir finds his mate made me wonder why I hadn’t been championing his book since he was first introduced. Naasir had decided he was ready to have a mate—someone he could have secret games with—in Archangel’s Shadows. He’s still on his quest when he meets Andromeda at the Refuge. He doesn’t understand how a mild scholar could be his mate. He worries she won’t understand him, but is determined to court and protect her anyway. He thinks back to lessons he learned from Dmitri about appropriate gifts for women. He’s going to do right by her. Only she’s taken a vow a celibacy, which complicates things. This isn’t one of those “vows” that we need to write with the quote marks. Naasir doesn’t treat it as such, either. Andi’s honor is important to him. So there’s no technical skating here. There are steps that have to be taken in order for her to be willing to be his mate. In other words: You’re going to have to wait for it. The waiting, though? It’s damn good. There’s so much heart in this book. Andi gets to see Naasir for who he really is. Her acceptance and understanding makes her a match as much as her fierceness. She has a hell of a cover, but don’t doubt she isn’t as badass as any Guild Hunter heroine. I enjoyed her quite a bit, and her playfulness with Naasir read as genuine. The Guild Hunter world is shifting and is on the cusp of becoming truly volatile. This isn’t a breather book, though. Andi and Naasir need to find an Ancient’s Sleeping place before another can kill him. These are the kinds of secrets myths are made from. In between there are kidnappings, escapes, fights in the sky and on the ground, and a whole lot of cleverness. Archangel’s Enigma is everything I love about the Guild Hunter series: brilliant, unique, honorable characters who fight for what’s right and the people they love. Badass fights, wicked verbal showdowns, big threats and bigger gains, and a romance that melted my heart. Bonus: You will find out what Naasir is! Double win. 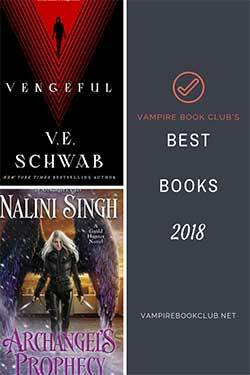 Archangel’s Enigma does the perfect dance between paranormal romance and urban fantasy that will most assuredly appeal to fans of either genre. I’m liking more and more when Nalini Singh veers away from Elena and Raphael too. Don’t get me wrong, I still love the Archangel and his consort but Nalini Singh has done such a great job developing these secondary characters. 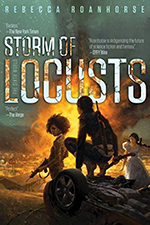 While I still loved Naasir and Andi, especially how important Naasir treated Andi’s vow, I almost felt like everything going on with the impending Cascade overshadowed things a bit with their story. I get what you mean, Amy. 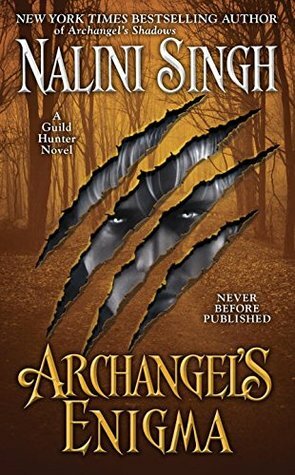 Though, I’ve always thought of Guild Hunter as urban fantasy with strong romantic elements (even though several have been straight-up PNR…I’m looking at you ARCHANGEL’S BLADE), so for me it was okay to have this change in the world be so prevalent. Plus, I think it worked because it gave them something else to focus on while not getting naked. I’m on the I want a Venom or Aodhan book. I can’t want to read but am currently listening to the series on audio before I start the new book, which also makes me want to learn more about Ainsley/Trace from Angel’s Dance. Let me know what you end up thinking of ARCHANGEL’S ENIGMA. This was probably one of my favorites in the series. I loved it!